Have you ever thought who could be an advertiser’s targeted audience? An advertiser’s dream? Would you be surprised if I told you they are kids? Strategy is important to be successful in advertising and generate revenue, so it is important for advertisers to know and understand their audience’s needs and wants. Marketers are extremely interested in children as consumers because of their incredible spending power, their purchasing influences, and how they develop as consumers in the future. Advertising companies have used creative techniques to market thousands of products on children’s programming channels to reach children as young as toddlers. These channels include television advertising, in-school marketing, specific product placement, kids clubs, toys and products with brand logos, and, of course, the Internet. Therefore, advertising companies are consciously manipulative in their advertising campaigns when they market to children knowing they will be easily influenced and often deceived by flashy marketing. Marketing companies take advantage of the new generation of children who are obsessed with television and technology. Children spend more time in front of the television and computers than any other activity except for sleep. “The Journal of the American Medical Association has said that the children between the ages of two and seventeen watch an annual average of 15,000 to 18,000 hours of television, compared with 12,000 hours spent per year in school” (Shah). So, kids see a constant barrage of commercials while they watch their favorite cartoons on children television programming specific channels such as Nickelodeon, Disney Channel, Channel One and Fox Kids. In fact, kids’ television shows and websites contain more advertisements than any other television program telecasts, and these commercials often include a popular character from a TV show to promote a product or service, which gives additional promotion to the product if the child enjoys that television show. During an hour of programing time, a child can see up to 15 minutes of commercials, which equals about 30 commercials per hour. “The average of American child watches an estimate between 25,000 to 40,000 television commercials per year.” [Also,] in 2010, companies spent over 17 billion advertising to children in the US, and it more than double what was spent in 1992 (Shah). However, most children aged 4 or 5 don’t understand the difference between entertainment and advertising, so they watch both with the same attention and intensity. Children between the ages of 8 and 12 start to develop their sense of identity and during these ages begin to understand the purpose of advertising, but they are still eager to buy what they want. Teenagers try to separate themselves from their parents and fit in with their peer group, so they become more independent consumers. As an example of manipulative marketing, USA Today writer Bruce Horvitz writes how fourth-grader Davis spends almost an hour a day on the Webkinz website. This website charms kids by linking Webkinz plush animals (Davis owns 18) with online games, therefore encouraging kids to earn and spend virtual money so they can create elaborate rooms for virtual versions of their Webkinz pets. Before children start talking, walking, reading, or writing, television advertisements prepare them to be the biggest consumers of their products, and even reinforce the idea of consumerism in virtual worlds. The children of today are greatly influenced by new media technology. Today, they learn by observing, imitating, and behaving on their own even though they lack correct judgment, so it is crucial that adults know what products are safe and good for them. In today’s world, media plays an important role in children’s lives. Everything is available at the click of the fingertips and now we can see how technology can make a difference in people’s lives. Children tend to be influenced by anything that seems attractive and entertaining to them, often without thinking. Sometimes children are eager to buy products not only because of need but because of want and popularity, so children act as walking advertisements when they talk about these products with their friends, therefore increasing the publicity of the product. The latest media technologies knows children think impetuously, and therefore uses this as a marketing opportunity. Marketers can also be misleading in their advertising messaging by trying to increase children’s self-esteem to buy their products. The Journal of the American Academy of Pediatrics notes that media education has been shown to be effective in mitigating some of the negative effects of advertising on children and youth (Shah). When children watch certain channels, in particular Disney and Nickelodeon, their behaviors change and they become more challenging. For instance, when younger children watch television programs that display teenage behavior, often using popular products or wearing trendy clothing, they think this behavior is appropriate for their age level. Examples of such behavior are acting out, not listening to your parents, always having a boyfriend or girlfriend and being popular is normal. They do not realize that, in real life, there are more important values to be learned such as truth, honesty and the family. Therefore, parents need to carefully and wisely monitor their child’s television programming and understand that their children can be easily manipulated, not only by marketing, but also by behaviors. They need to make sure to effectively communicate the pros and cons of product and explain them what is good or best for them effectively with their children. Marketing to children is an insidious form of advertising, and it creates the culture of consumerism. Children are the group most easily convinced and deceived by the attractive advertisements. This is why supermarkets, grocery stores and even pharmacies position products desirable to children like candy in a lower position so children can see and reach them more easily. Also, product placement at the point of sale is more desirable and is more likely to guarantee a sale because the parent does not have the time to think about the purchase; it is more of an impulse buy. In this way, businesses increase their profits. Nowadays, kids can make decisions independently of their parents, so marketers often teach kids how to eat away at their parents’ resistance through constant and continual nagging. Most parents have been the victim of this, I am sure. According to a survey that was conducted by an independent consumer marketing and advisory service, the NDP Group, reports the average amount spent on toys per child was $371 U.S. dollars in 2013. Also, children who live in America spend $29.4 billion a year on toys – $76 million on dolls, $349 million on plush toys, $125 million action figures, $279 million hot wheels and matchbox cars, $88 million sporting goods items and so on (Shah). Without a doubt, none of these toys offer any significant educational value so therefore are not essential to a child’s well-being. These statistics therefore indicate that children have been remarkably successful at convincing their parents to purchase toys in these specific toy areas, all because advertisers have manipulated them into believing they should have and need these toys. In the last few years, there has been a growing movement to protect children from these kinds of marketing practices. For example, after Apple allowed kids to make purchases in apps without their parents’ consent, Apple was forced to refund millions of dollars to (Yousuf). This settlement is a victory for consumers who had been victims of the app’s advertising to children as well as Apple’s unfair billing; therefore, this settlement serves as a warning to the business community and illustrates the negative implications of manipulative marketing to children. A Wall Street Journal poll shows that 64% of people surveyed believe that popular characters from television and movies should not be used to sell products to children and more than 50% believe that marketing to children under 12 should be prohibited (Bright). The USA Today article “Financial Teaching Tool for Kids: Santa” discusses this is the time to teach children healthy consumer behaviors and to be responsible. It is true that children have incredible influence as consumers and it is wise of advertising companies to market their products to this specific audience, just as they would market products to other specific audiences such as women or older people. The issue is that children lack the judgment needed to make the right choices about the products they want and desire and the marketing companies know this. If I know I can convince a child do something by giving candy or displaying something flashy, is this morally right for me to do as an adult? The promise of sweet candy, the newest technology, or the “next best thing” is not always the right thing and when your consumer is someone who lacks the ability to make rational decisions, then marketing in this way is not only manipulative, it is morally wrong. Instead, market to the parents who earn the money, pay the bills, and nurture the children whose products they will use. “Apple to Refund Millions for Kids’ In-App Purchases.” CNN Wire, 15 Jan. 2014. Opposing Viewpoints in Context. Web. 31 Oct. 2014. “Average Amount Spent Per Child On Toys By Country In 2013 (In U.S. Dollars)”. Chart. NDP Group, 2014. Web. 04 Nov. 2014. Bright, Becky. “Poll Shows Growing Concern about Role of Advertising in Child Obesity.” Wall Street Journal, 20 Aug. 2007. Web. 30 Oct. 2014. Horovitz, Bruce and USA Today. “Marketers Target Kids with Tech.” USA Today, n.d.: Academic Search Premier. Web. 02 Nov. 2014. O’Donnell, Jayne. “Financial Teaching Tool for Kids: Santa.” USA Today, 20 Nov. 2008: 05B. Opposing Viewpoints in Context. Web. 27 Oct. 2014. Shah, Anup. “Children as Consumers.” Globalissues.org, 21 Nov. 2010. Web. 30 Oct. 2014. Instructor comments: Nayomi did an excellent job of incorporating many different sources into her research argument, and integrating them with her thesis. Her conclusion is particularly strong because it synthesizes all of the information into a coherent, confident statement, and makes a recommendation. 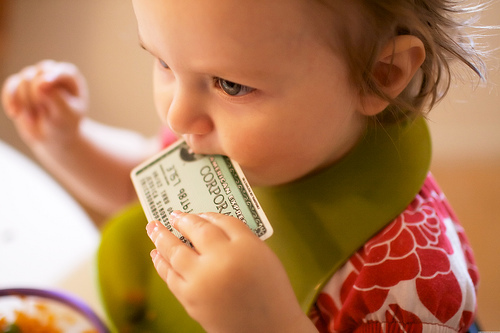 Photo credit: “Food for the Wallet” by _Dinkel_. Licensed through Creative Commons.